Okay, I’ve become my mom. I absolutely hated these pancakes growing up. HATED. And I swore I would never, ever, ever make my kids eat them. But now I do. I tell myself it’s okay because I made one tiny change to the recipe, so really they aren’t the same. Right? The recipe is Bosch’s Blender Pancakes. And the blender was the part I’ve always hated. Apparently you’re supposed to add wheat kernels and the rest of your ingredients in the blender, turn it on, and voila! 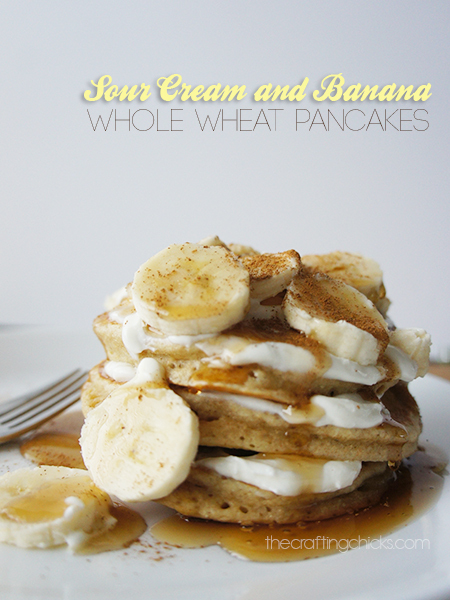 the wheat will turn to flour and you have whole wheat pancakes just like that. Except, it never turns to flour. So what you get are crunchy pieces of wheat in your pancakes. And that’s gross. I do hear that the newer blenders (like Blendtec and Vitamix) do a better job with the wheat, but I’m not going to find out. 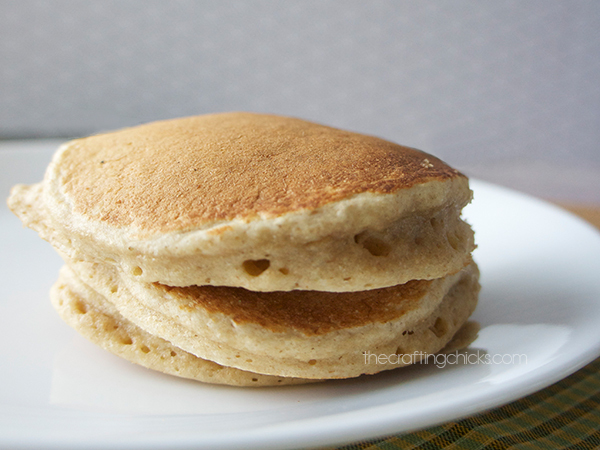 Instead I substitute already ground whole wheat for the wheat berries and get smooth, whole wheat pancakes. Aren’t I the better mom? If you don’t have a wheat grinder, but you do have a fancy blender, feel free to give the blender method a try and let me know how it turns out for you. 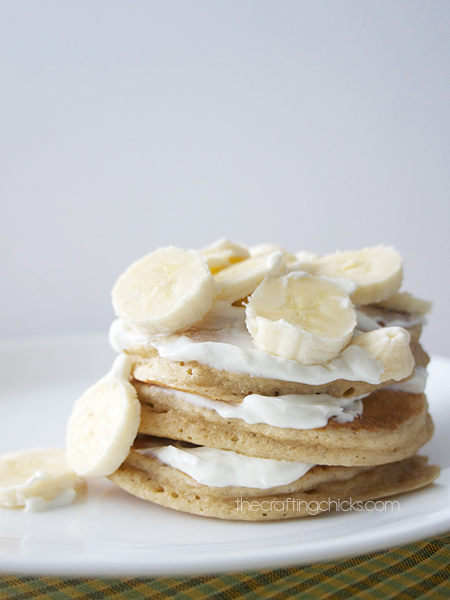 While I was growing up, my parents went away and stayed at a bed and breakfast somewhere, and they fed them pancakes with sour cream and bananas on top. To this day it is the only way my dad eats his pancakes. It sounds strange, but it is good. Cook the pancakes to perfection. Spread sour cream, or plain Greek yogurt, or just plain yogurt, or heck you can use vanilla yogurt if it’s what you’ve got. I won’t judge. Then cut up a banana on top. 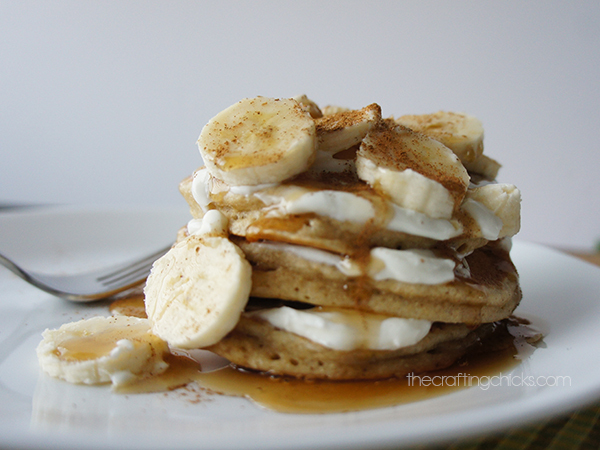 Top it all with maple syrup and a dusting of cinnamon and enjoy! If I was a foodie I would tell you that we use real maple syrup. But I’m not and we buy Mrs. Butterworth’s by the gallon. So use whatever syrup your taste buds prefer, or your little people insist on. Mix all ingredients. If it is still a little thick, add a splash of milk until it is the consistency of pancake batter. Pour on griddle and bake each side about 1 min. Until bubbles form and pop on the outside. 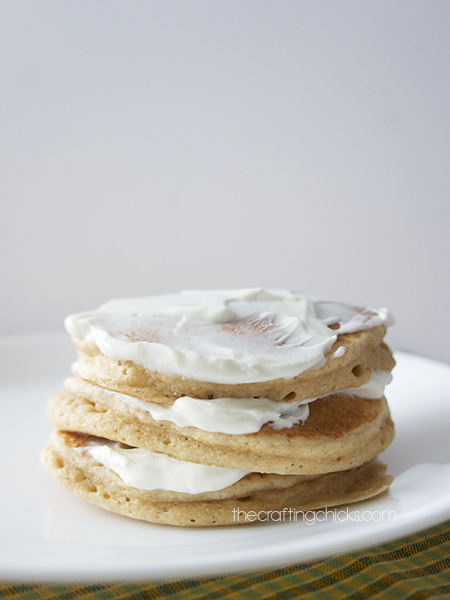 Spread sour cream, or plain yogurt on pancake. Slice a banana on top. Top with maple syrup and a sprinkling of cinnamon. I’ve been using my BlendTec as a wheat grinder ever since we purchased it over 3 years ago. Works beautifully! Thanks for a delicious recipe! These look amazing and pretty healthy, too! I think I would just use fat free yogurt and sugar free syrup, and that would healthy it up for anyone counting calories. Thanks for the great recipe!